The shape of this bag is such a traditional bucket, with the hard, structured bottom and the soft perforated top. The smooth drawstring and shoulder strap tie the look together, although I might prefer if they were in the same color leather as the perforated leather body. I'm just not sure that the bag needs the contrast. My major bone to pick with this style is that the perforated part of the bag isn't lined. Sure, this adds to the look somewhat, but it vastly decreases its durability. And for $1,495, I really want a bag that will last. The bottom, however, is both sturdy and fully lined, so if you're feeling the look, it might be worth the risk. 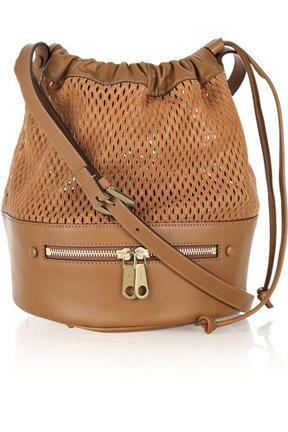 The Botkier Jaden Hobo, a larger alternative to this bag.